I may be a Yorkshire-woman by birth, but my heart has been in the West Country since I first visited 40 years ago. Living close to the coast has always been a dream, not only for the beauty and the wildness; but also for the opportunity to grow some more unusual plants in the milder coastal conditions. So excitement was high in June as I left behind what had been my base for most of my adult life and headed to the South Hams of Devon to set up a new home and garden advice business. What is more, for the first time in my life I owned a garden bigger than a postage stamp! One third of an acre of garden, orchard and woodland perched high above the Avon Valley near Kingsbridge. The sensational views across the valley which put us on birds-eye level and make me sometimes feel I am living in a tree-house, also come with a very steeply sloping garden in places. The garden finishes just beyond the lonesome Pine in this photo, most of which is hidden as the slope drops off quickly beyond the Rose hedge which is just coming into flower in this photo taken the week after we arrived.
. The borders either side will become a tapestry of ferns, Hellebores, and other textural woodland perennials. Here are a mixture ready to be planted. We have also started to renovate the mini orchard by mowing paths through the rough grass and planting apples, pears and plums. Wild flower plugs and spring bulbs for naturalisation will also go in this autumn. The moist, mild west country climate is perfect for Hydrangeas and here are a few that have graced the garden for the last 3 months. I think I might just have fallen in love with their generosity of flower as they tumble down the slopes; some a little blowsy, others very elegant. They will need a little extra pruning in spring to bring them back under control as you can see! Roses also seem to thrive in the conditions here. The previous owner of our house trained these Ramblers beautifully over a low fence. I purposely did not deadhead the Roses as they faded as I knew we would have an amazing show of hips too if I left them alone. And we have. The joy of my new garden is the mixture of habitats and conditions, each suiting different types of plants and planting styles, and the wonderful countryside surrounding us. Creating a garden which acknowledges all of this and sits comfortably as a foreground to the view is going to be a lot of fun. Oh, and here is my neighbour, Fudge. He keeps an eye on what I am up to over the fence! High above New York’s bustling streets there is a green surprise in wait. A garden in the sky. This is The High Line, an elevated, linear park that was opened in 2009 on a disused freight rail track that had closed in the 1980’s. Archive photos before work began. The High Line’s planting design is inspired by the self-seeded landscape that grew up between rail tracks after the trains stopped running. Today, the High Line includes more than 500 species of perennials, grasses, shrubs, and trees – each chosen for their hardiness, adaptability, diversity, and seasonal variation in color and texture. Piet Oudolf designed the planting. But sadly all good things must come to an end….and it did! Looking very strange; a piece of woodland looming over the busy New York streets! I loved the planting and the atmosphere it created, and admired all the work put in by the energetic and passionate ‘Friends of the High Line’. If you are in New York please try to visit. Ninety-eight percent of the High Line’s operating budget is covered by voluntary contributions. Still weighing up whether I should be wearing a flower in my hair (fifty years too late! ), I made my first visit to San Francisco last year. I loved the city; and part of the reason for that was the beautiful tree-lined streets in many of the neighbourhoods. Since the 1980’s there has been a movement to revitalise the city’s Urban Forest through community participation. The Friends of the Urban Forest help individuals and communities green their own streets, creating a more attractive and healthier environment, reducing crime, absorbing traffic noise and pollution, reducing temperatures and capturing rainwater so reducing flooding. Those miniature gardens below the trees are also all over the city and are a brilliant idea benefitting from the microclimate created by the tree. Pull up a few paving slabs and off you go! We walked for miles exploring the city and those streets with a beautiful green canopy made a real difference on a hot day. Another green surprise are the staircase gardens linking one switchback street to another. They are mini green spaces enhancing the neighbourhood and making their exploration a real pleasure. Great views across the city too. And I just can’t resist a tree wearing a cosy! More next time on a surprising and iconic green space in New York! One of the joys of a garden for me is that it will never be the same from one year to the next. It will grow, change, mature and eventually decline and the fun is to manage that development and create a balance between the plants so that each can fulfill its potential. Whether your garden is five years or 25 years old it will need ‘editing’ if you want to keep it looking at its best. I am often brought in by clients who have inherited a mature garden and know that although they don’t want to dig up the whole thing and start again, there needs to be a process of revision to bring back the balance to the garden. This imbalance can happen because trees and shrubs have grown bigger than their allotted space and are competing for space, light and nutrients. They might be creating shade where once there was a bright, sunny space and smaller plants beneath the canopy are suffering. Spontaneous plant purchases often result in a plant growing too big for the only space available when it was bought or not suitable for the soil or aspect. If you only visit the garden centre in the summer then your garden may be full of plants that look good at that time but with nothing for the rest of the year! Winter is an excellent time to look critically at the borders. Try to be objective and plan to keep only those plants that contribute throughout the year to the overall picture. If something has outgrown its space but you love it then try giving it a renovation prune in the spring to within 60cm of the ground. Look at the RHS website for advice on which plants you can safely do this with. If two shrubs have grown into each other make a decision about which to keep and which can go based on performance and shape. Widening a border may make it easier to manage as shrubs can be allowed to reach their natural girth rather than having to be constantly pruned back. Think about the shape of the borders. Sweeping curves look better than bitty wiggles and are easier to maintain. If formal is more your style then make sure lawn edges are straight and crisp. Like humans, plants do have a lifetime which varies enormously so don’t be afraid to replace those that look tired and leggy. Would you choose the same plant again today? If it does’t earn its keep in terms of flowers/foliage/bark then harden your heart and take it out! Look at photos on Pinterest and Instagram as well as in magazines and books for inspiration and for a fresh view. Take photographs of the border, cover with tracing paper and try sketching a visualisation of how you would like things to look like when you have removed/pruned shrubs or perennials. Mark the new shape of border edges on the ground with a hose-pipe or sitcks and string. Spring is a great time to actually start work on renovations. Remove those plants that are dead, diseased or you have decided will not fit into the new border. Roots need to go too or you won’t be able to replant in that space and unwanted new growth may spring up. Prune those shrubs that you have decided to keep either by cutting right back or removing one third of the oldest branches referring to RHS website. Consider raising the canopy of shrubs so that you can plant perennials and bulbs beneath for an extra layer of interest. Keep stepping back to asses how the shrub looks as you prune. If the crowns of perennials are infested with weed then you could dig them up, shake off the soil and remove every scrap of weed root. Dig out weeds in the border by hand or, as a last resort, carefully spray really invasive weeds such as ground elder or bindweed with a glyphosate-based weedkiller. It is so important to get as much weed root out as possible otherwise they will compete for light, water and nutrients with your new plants. Perennials benefit from being dug up regularly in spring or autumn and splitting into smaller pieces, getting rid of the less vigorous centre pieces, and replanting further apart with space to grow. Feeding and conditioning the soil with organic matter is much more beneficial (and better for the environment) than feeding the plant with artificial fertilisers. It improves the structure of the soil as well as feeding the plants. I specify digging in garden compost/well-rotted manure/green waste compost/leafmould/spent mushroom compost whenever I am renovating a border or planting a new one from scratch. A couple of bucketfuls per square metres dug into the top 30cm of soil will be an enormous long-term benefit. Many councils sell green waste compost created from the garden waste they collect from us. Cut the new shape of the border into the lawn and lift unwanted turf with spade or a turf-lifter. 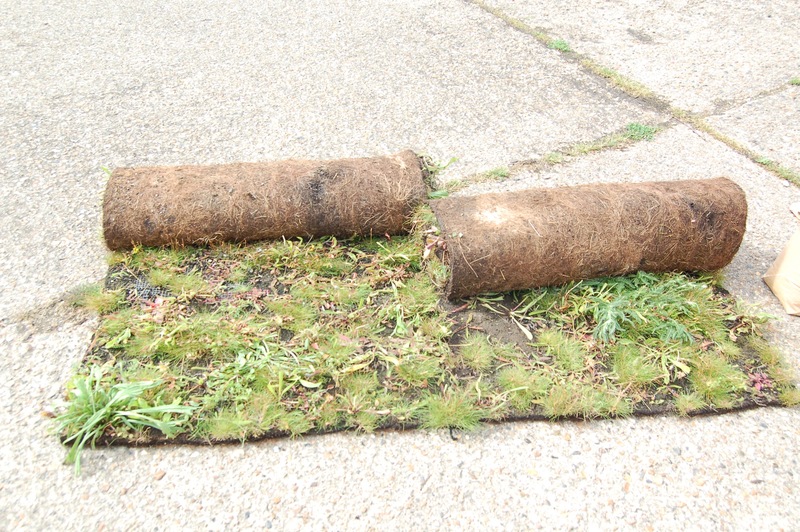 Stack this turf upside down in a corner of the garden as it will rot down to produce excellent compost. Now the fun bit! Choose your new plants carefully having worked out the type of conditions you are going to be providing them with. Ask yourself what the aspect of the border is….sunny, shady or a mixture of both? Soil type is also key in choosing plants. Is it heavy clay which sticks to your boots or sandy soil which dries out quickly? Get a soil testing kit from the garden centre to work out pH (acidic, neutral or alkaline?). All these factors should guide your choice of plants. Next think about successional interest through the year. Choose some plants which look good in autumn and winter as well as spring and summer. This can be leaf or bark colour or structure from dead seed heads or the tracery of branches. Make sure you provide pollinators with nectar for as long season as possible. Research height and width of plants at maturity to make sure they will fit the space. One-third evergreen to two-thirds deciduous is a formula that works well for shrubs. And lastly, of course, decide on a colour scheme which helps to focus the choice of plants further. Remember this needs to fit in with any plants that remain from the original scheme. Phew! Now you know why planting plans take so long to create! Take a tip from designers and place all the plants out in their pots on the border before you start to plant and move them around until you are happy with how they combine. Plant perennials in groups of at least 3 to avoid a fussy,spotty look. Make sure all plants are at the same level in the soil as they were in the pots. Too high or too low may spell disaster for the plant. Water them in well so that each plant gets a couple of bucketfuls of water. Repeat once a week for the first season, a good soaking once a week is better than a sprinkling every day. Consider mulching with 75mm of pine bark nuggets which will help retain moisture and cut weeding by two-thirds. If you do, make sure mulch is kept away from the stems of shrubs. All done! Pour yourself a well-deserved cup of tea or glass of wine and sit back and enjoy your fresh new garden! 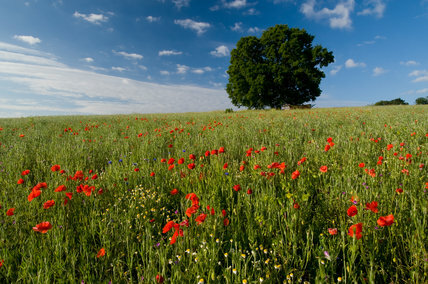 We have lost 97% of our lowland wildflower meadows since the end of the second world war. This in turn has lead to loss of habitat for pollinators and insects resulting in many of our previously well-loved birds and small mammals falling in numbers dramatically. Many of us would like to help rectify the loss in our own gardens and with this in mind I spent an interesting day at Wisley Gardens in Surrey yesterday on a course organised by the Royal Horticultural Society. 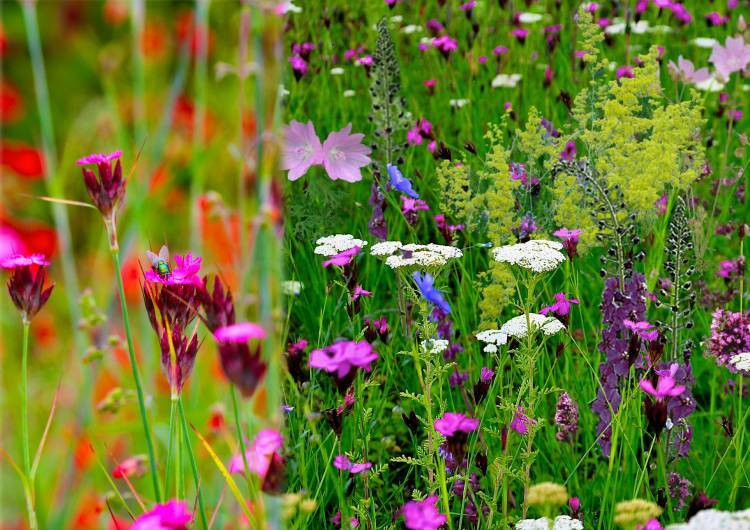 Aimed at Garden Designers, Head-Gardeners and local authority horticulturalists, it was called ‘Learning to Design the Wild: wildflowers and naturalistic planting in horticulture’. I didn’t really grasp the the relevance of the word ‘learning’ in the title until well into the day, when I began to realise that even those working at the top of the horticultural world are still learning the best methods of establishing and maintaining wild-flowers in a garden setting. What I learnt was that there are various methods being experimented with and what is key is to choose the one that best suits your soil, situation, budget and maintenance abilities. It is worth saying that wild-flower meadows are definitely NOT a low maintenance option, as some have suggested, but there are ways of short-cutting the complications of establishment and of creating impact on a budget. 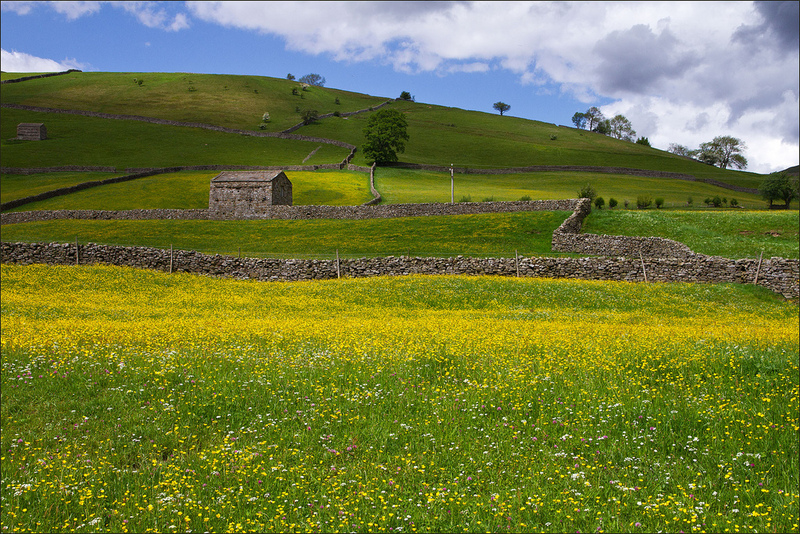 Once you understand that Wildflower meadows are dynamic communities, changing throughout the year and from one year to the next then you start to see that planting wild-flowers can be a long-term management challenge. A lot of fun, but a challenge all the same! We talked about everything from a tiny wild-flower lawn in an urban situation to the huge Big Sky Meadows project at RHS Hyde Hall. Here, an initial 7 acres was seeded in January with many more acres to be put down to wildflower meadows over time. I’m sorting through all the useful information we were given to pick out what will be most useful to me as a garden designer. Utilise your existing lawn, or a part of it. 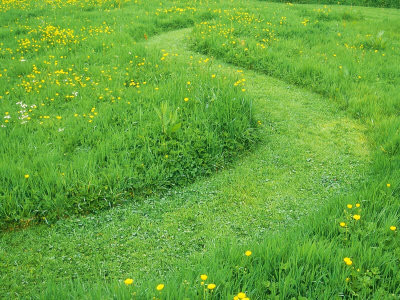 Stop mowing regularly, let the grass grow and see what appears. Weed out coarse unwanted weeds by hand. In the late summer/autumn of the first year mow and scarify the grass. Supplement wild-flowers that appear naturally with plug plants of ones that you would like to see plus some small spring bulbs to naturalise if budget allows. Sprinkle parasitic Yellow-rattle seed to suppress vigorous lawn grasses at the same time. In a low fertility soil, and where you are prepared to put in some work establishing the meadow, then broadcasting seed on prepared soil is a good budget option. in the spring, mow the area to mark it out. Spray off with glyphosate-based herbicide or lift turf. Level the soil and scatter the seed mix. Rake in and roll soil or trample in with boots. Water. An annual mix can be left to go to seed then cleared at the end of the following winter. Hopefully seeds will germinate and you will get a show the following year. After 2 years you will probably need to start again with fresh seed to prevent the mix becoming dominated by one or two species. A perennial mix takes a little more horticultural input but will come back each year. 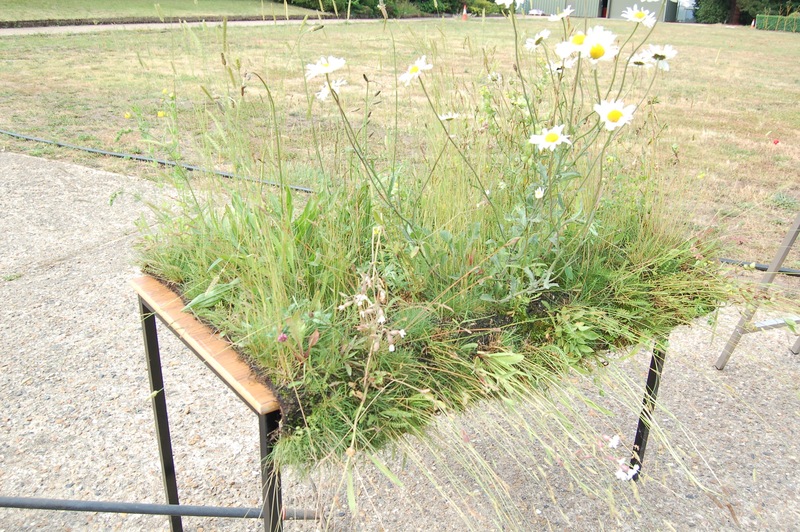 Wildflower turf is a product developed to shortcut the hard work of establishing a meadow from seed. It is a wildflower meadow in a roll! 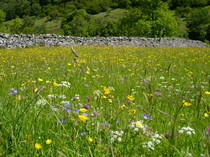 Delivered and laid like ordinary lawn turf, the wild-flowers are already established on a growing medium. There will not be the same competition from weeds though you will still need to manage the meadow by weeding out undesirables that appear and cutting at least a couple of times a year. Useful for difficult areas such as sloping pond sides or sloping gardens where seed might be washed away by rain. Suitable on heavier, more fertile soils. Not the cheapest method but is one of the easiest ways to ensure successful establishment if managed correctly. Turf can be bought suitable for specific situations such as underneath trees or on a green roof. Time your mowing regime to prolong flowering. A cut in the summer before seeding will often encourage another flush of flowers later in the year. Mowing, weeding by hand or spot weeding with glyphosate are techniques which can be used to deal with over-competitive species of grass and flowers and unwanted invadors such as dock and thistle. Mow regularly around the edges of the meadow to show the long grass is deliberate. In larger areas mow paths through the meadow, and maybe even a circle for a small table and chairs, so you can really benefit from the environment. If you design a meadow close to vegetable crops or in an orchard then you will find that the insects attracted in will also pollinate your crops and provide a natural method of keeping pests down! So consider a place in your garden for wild-flowers this year and have a go! It will be lots of fun and you will be helping our pollinators thrive again.